I had never tried pork shanks before. I was used to making lamb shanks but it is not easy to find those in Italy. However on the other hand, pork shanks are very popular. They are very big so one shank is enough for two persons. The Italians usually roast them in the oven or else leave them to cook in a lovely red wine sauce until the meat practically falls off the bone. Really really delicious! Place the pork shank in a freezer bag together with the vegetables, the spices and the wine and leave to marinate overnight in the fridge. The next morning drain the shank and roll it in the gluten free flour. Heat a little oil in a pan and cook the shank until browned all over. Add a dash of brandy and then add all the marinade. Bring to the boil, lower the heat, add the tomato paste and stock, cover the pan and leave to simmer for about two and a half hours, stirring and turning the shank occasionally. 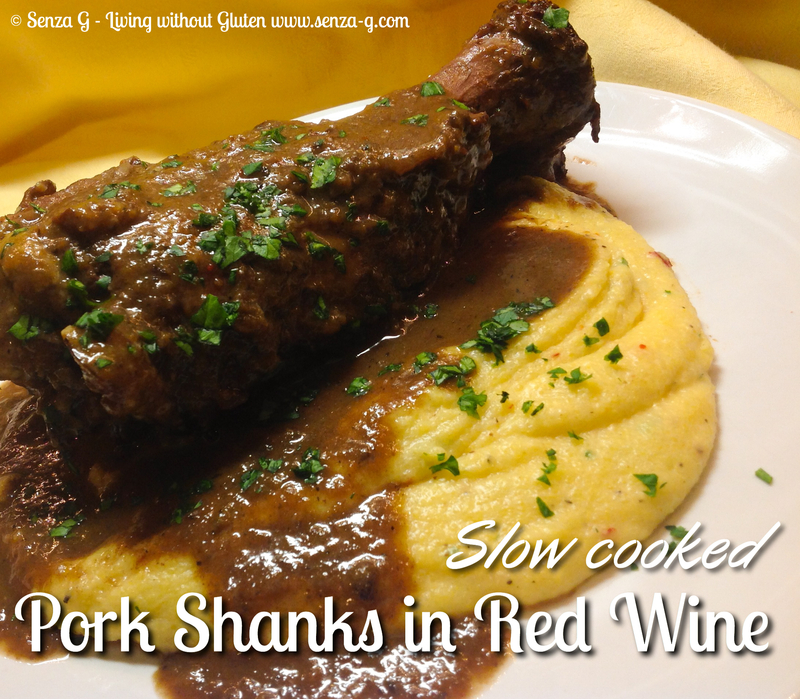 You can also continue cooking the shank in a slow cooker at this point. When the shank is tender, remove from the pan. If sauce is too thin, thicken it with a mix of cornstarch and water. If too thick, add a little more stock. Then pour the sauce in a food processor and blend. Divide the shank meat and serve with the sauce poured over. I served mine over a bed of creamy cheesy polenta but you can also serve this with mashed, baked or fried potatoes.